While driving the other day, I listened to “A Prairie Home Companion” on NPR spoofing a marital mini-spat in which the wife was trying to get her husband to stop chuckling, so she just re-named him “Chuck.” Well I need to say that my now re-named husband “Chip” has a salsa obsession. He loves his bowl of tortilla chips and something to go with them. I object to those very expensive jars of glop sold in the grocery store as salsa, so during the summer, I can tomatillo sauce, several types of tomato salsas and peach salsa. The pantry by now is getting thin, so I’ve been looking for new alternatives beyond the other standards like hummus. How we came to have a glut of organic mangoes in our markets is beyond me, but we’re enjoying them every which way. Here’s a flavorful salsa with sweet and hot peppers, red onion, lime juice and cilantro, all ingredients that I happened to have on hand. The relative amounts of ingredients can vary by taste and availability, but my rule of thumb is to mix colors (orange, violet, red, green), textures (soft mango, crunchy onions, semi-crunchy peppers, and crisp herbs), and tastes (sweet and hot at least). Combine all ingredients and let sit for a few minutes to “get acquainted” before serving. 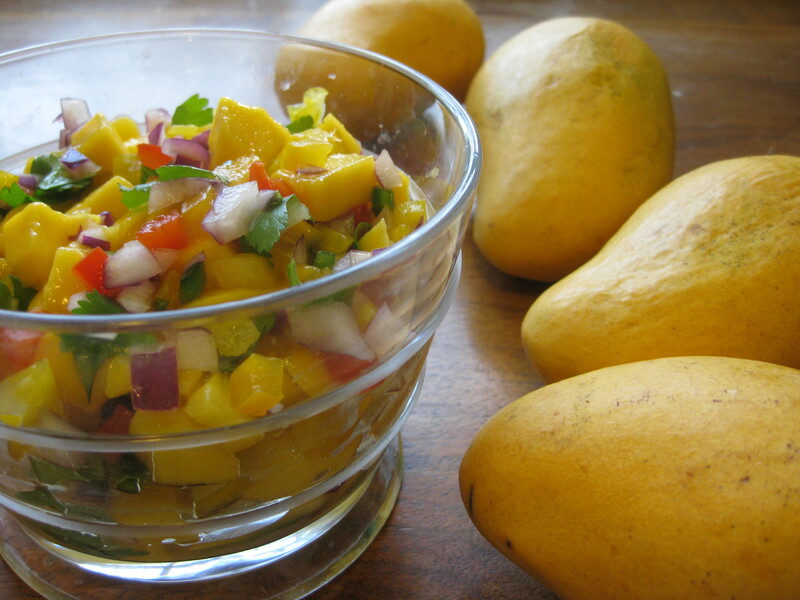 Note about cubing mangoes: Mangoes have a central pit that clings to the fruit. So the best way to produce cubes, after peeling the mango, is to grid the fruit. I grid it pole to pole along the widest part (the pit is like a bulging ellipse) since it lays flatter that way. Laying it flat, I cut through to the put this way that way to produce squares, then stand it up vertically and peel the cubes off the pit.